When there is excessive bleeding or swelling after surgery or an injury, the result can be increased pressure at the location of the damage. The increased pressure affects blood flow and can lead to muscle damage, tissue death, or amputation. This condition is called Compartment Syndrome. Internally, your arms and legs are divided into well-defined spaces or “compartments” by a thick membrane called the fascia. The fascia is very strong and non-elastic. Within these compartments are the nerves, blood vessels, tendons, and muscles of your extremities. Because of the fascia’s inability to stretch, compartment syndrome develops when swelling or bleeding occurs inside the compartment. The swelling causes the blood to become trapped, increasing pressure on the capillaries, nerves, and muscles within the compartment. Losing oxygen and nutrients, nerve and muscle cells within the compartment become disrupted and damaged. Compartment syndrome can be chronic or acute. Acute compartment syndrome is usually brought on by an injury. This type of the condition requires immediate medical attention. Without it, permanent muscle damage can result. Chronic compartment syndrome, or “external compartment syndrome,” is usually experienced by athletes, but anyone can develop it. It is not a medical emergency, and is usually the result of athletic exertion. It is also occasionally referred to as exercise-induced compartment syndrome. Constant biking, jumping, running, or swimming may cause compartment syndrome. Generally, if a person curtails these activities, the pain and swelling will subside. Acute compartment syndrome is generally caused by a severe injury like a broken bone, severe sprain, or deep bruise. It almost never develops with minor injuries. The most common symptom of acute compartment syndrome is extreme pain when the muscle is stretched. The most common symptom of chronic compartment syndrome is usually pain or cramping during an exercise routine. Pain typically begins soon after an exercise starts and worsens during the exercise. With chronic compartment syndrome, the pain usually subsides within a half-hour after the activity stops. Over time, the pain may last longer after exercise, possibly lingering for a week or two. The hallmark symptom of compartment syndrome is severe pain that does not respond to pain medication or elevation of the affected limb. Paleness of the skin and a decrease in sensation may also be associated with severe cases of this condition. Occasionally, symptoms do not appear suddenly, but gradually worsen over months or years. Chronic compartment syndrome is often mistaken for shin splints by people who do not recognize its symptoms. Acute compartment syndrome should be considered a medical emergency, and treatment should be sought as soon as possible. Exercising through the pain may lead to problems such as permanent nerve or muscle damage. If you have been injured, you should seek medical attention immediately. Your doctor will be able to determine if you have acute or chronic compartment syndrome. In most cases, acute compartment syndrome can be diagnosed rather quickly with a visual physical exam and x-rays. Diagnosing chronic compartment syndrome may take longer, as the doctor will need to rule out other potential conditions that cause pain within the lower leg—e.g., shin splints. Your doctor will also give you a physical exam that involves squeezing the specific compartment to see if there is pain. After that, your doctor will measure the pressures in your compartment before and after exercising. He or she will do this by inserting a needle attached to a pressure meter into the affected compartment. 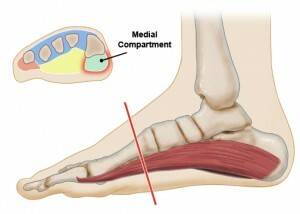 If the levels remain high while you are at rest and after exertion, you will be diagnosed with compartment syndrome. There are surgical and non-surgical ways to treat compartment syndrome. For acute cases, the condition should be managed with topically applied ice and elevation of the affected limb. If surgery is necessary, in most cases, a fasciotomy is performed. This procedure involves making an incision to cut open the skin and fascia that covers the injured compartment. Your doctor will then need to wait until the swelling decreases before being able to close the incision, typically after 48–72 hours. For chronic compartment syndrome, physical therapy, orthotics, and anti-inflammatory medications are non-surgical treatment options. Avoiding the activity in that is causing the condition is also an option. If these methods fail, a fasciotomy or a fasciectomy (removing part of the fascia) will be performed. The surgical goal is to make additional room for the swelling. Wounds are typically left open but covered with surgical dressing, then closed during a second surgery two or three days later. Skin grafts are sometimes used to close the wound. Both procedures have a very high success rate, with the most common problem being accidental damage to a nearby nerve (permanent nerve damage can occur after 12–24 hours of compression). Still, overall prognosis depends on the type of injury that causedthe syndrome. Additional complications that can arise after a fasciotomy include the formation of scar tissue and a loss of mobility in the joint due to the thickening of surgical scars. However, these issues can be resolved through occupational or physical therapy. How Can I Prevent Compartment Syndrome? After treatment begins, what symptoms should I watch for that may indicate the problem is not improving? Based on my condition, will I need to miss work during the healing process? For how long should I elevate my affected limb?